Historically, French wine has dominated the Russian import market. In 2012, 37.4 million bottles of still wine from France were imported into Russia - 20.25 percent of all imports. Even so, French wine imports have stagnated in recent years as the market has moved towards Italian vintages. Russians have long preferred Italian sparkling wines such as the Muscat-based sparkling wines from the Asti region and traditional Italian vermouths such as Martini, and in 2012, Italian still wine imports reached 16.24 percent of the Russian market. 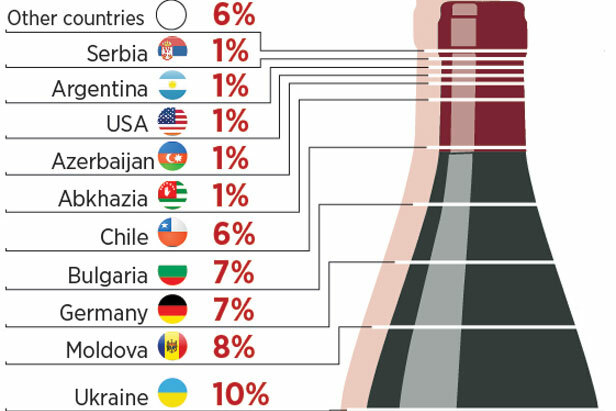 The United States ranks 11th on the list of Russia's biggest wine exporters, with a 1.37 percent share.